I'm so excited! 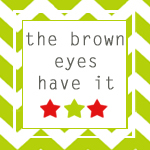 I have my very first review and giveaway to share with you today. Liz from My Memories contacted me a few weeks ago about sharing this great digital scrapbooking software with you. Since I've recently become a full convert of digital scrapbooking, I jumped on the chance to try it out. Before I get into this software, let me tell you why I'm a convert, especially because I get asked this question all the time. Having 6 kids, plus our family book to work on I have A LOT to scrapbook. Needless to say, I'm very behind. So I was trying to find a faster, easier way to get caught up. 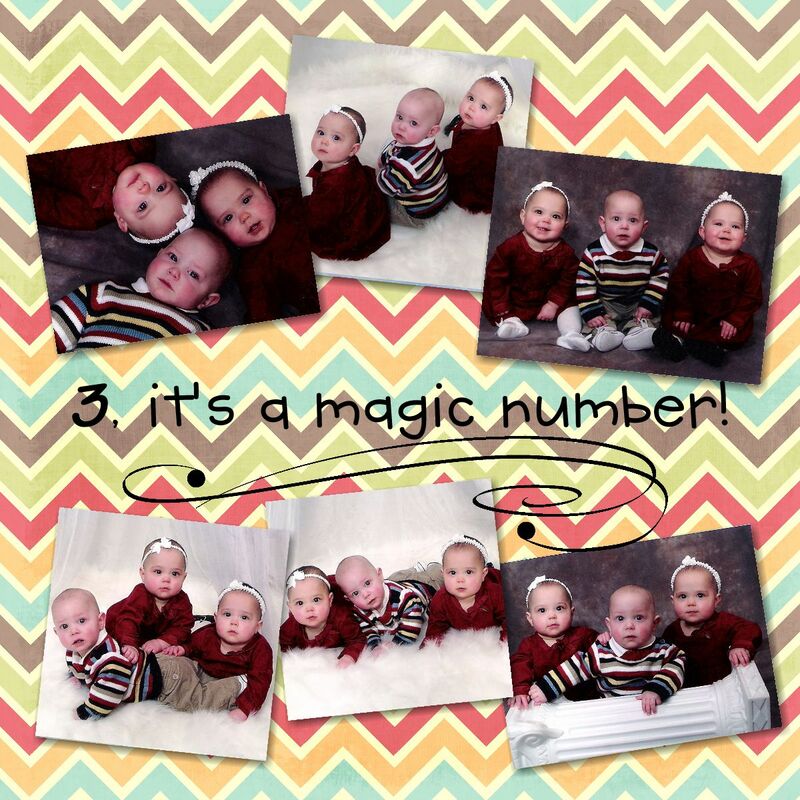 I decided digital scrapbooking was the answer. However, I still loved working with my hands and the actually putting together of a great page. So I decided I'd scrapbook our family book the old way with the tangible papers, embellishments, etc. and I'd do my kids books digitally. That way I could make one Christmas page and change out the main picture and put it in 6 books. Well, that was before I actually tried it out. I had so much fun on the computer, and it was so quick, who needs to do the cutting by hand. :) This summer as Cheyenne and I were scrapbooking, I got 9 pages done (just changing the focal point pictures and a little journaling) in the time it took her to do 2 or 3, and she's a very simple, not many embellishments kind of scrapbooker. It was so fun! I still got to pick out all my embellishments and papers, but didn't have to run to the store to find the perfect thing every time. Plus, the whole reason Bill bought me the software is so my scraping area stays clean, he hates a mess. When I had to stop in the middle of a page to run a kid somewhere, I just clicked "save" and I picked right back up the next time I had a minute. No rushing to clean up all my scraps, trying very carefully not to move the perfect layout before it's glued on, or kids getting into what I've done while I had to go cook dinner. Another advantage to digital, the cost. Digital kits are so much cheaper, usually, than buying the same amount of papers and embellishments from the store. Plus, you get to use them over and over again. So back to Liz. I got to download the My Memories Suite software and play with it for a while. My review - I really liked it. It was very simple to use and had some great features. After a few minutes, okay about 1/2 half hour, I had this page completely done. It was so easy, the part that took the longest was deciding which pictures I was going to use. Even more fun, when I look at this on my computer, or if I burned it to a cd, it has nice background music to it and I can click on one of the pictures and it shows me a cute little video of these three. So cool!! I also made an awesome page of Billy playing football and added the clip of one of his games. Now that is fun! I know several people who burn their books onto dvd's and just watch their scrapbooks on tv, this is a great feature to merge all those videos with the pictures you take. I love this feature! I also made a cute card, well, it was much cuter until I remembered I don't have a color printer anymore and had to change things to black and white. But it's still okay. Just picture this in whatever fun colors you like, and think of how quickly you could make lots of fun, cute cards so easily. You can do so much more than scrapbook, too. You can make calendars (great for Christmas presents), cards, posters, handouts for church lessons or visiting teaching, party invitations, teacher gifts (how fun would it be to make a little book of your child's classmates with a little note from each child and/or parents) and much more. If I haven't convinced you yet, watch this quick video clip or this longer one to give you more info. Now for the very best part!! I get to giveaway a My Memories Suite, a $40 value, to one of my wonderful visitors. Or if you can't wait or don't want to take your chances, you can use this code: STMMMS28745, and get $10 off the purchase price. Plus, the software comes with a $10 off code to the My Memories Store, so your $40 is now only $20. Woo, hoo!! That is a great price! 2. Check out Mymemories.com and tell me which kit you like or could use most. Easy peesy! Just leave me a separate comment for each entry. This entry will end at 11:59 p.m. (MST) on September 6, 2011. Wednesday was a very big day at our house, the day my kids went back to school. 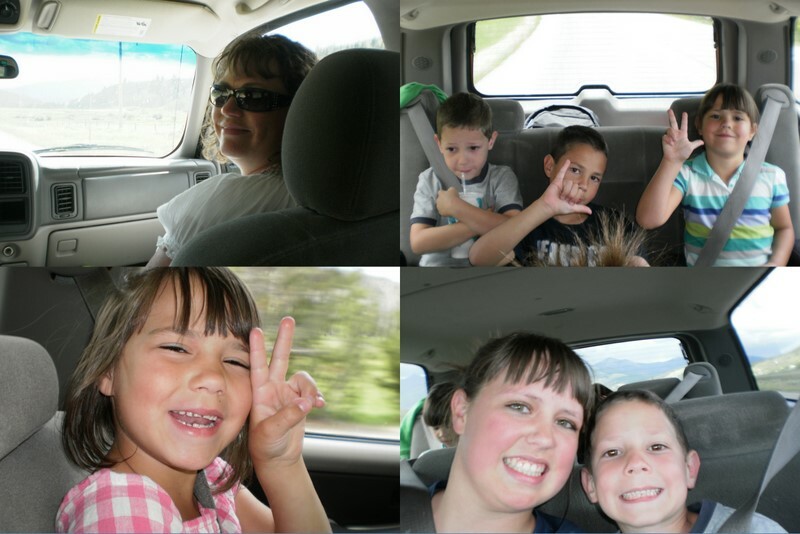 Now this was made a little more momentous because my oldest was starting high school, second daughter was starting jr. high in a new school, too, and my youngest three were starting 1st grade. All my babies were gone all day long. The day before, we walked through the high school and jr. high, hoping to find all their classrooms and lockers and stuff, hoping to alleviate a little stress the next day - it helped a little, although Cheyenne still got lost once. :) So at about 8 a.m. I watched as they all left me, they just walked away onto that big yellow bus and probably never thought about me again. What did I do, did I break down and start bawling? No, that was so last year. I did a little happy dance and then sat in an eerily quiet house. I took a deep breath and realized I hadn't been alone for this much time in over 15 years. Then I went to work. I ran to the computer and quickly printed up this recipe from Somewhat Simple for hostess cupcakes, a treat for after school. While those baked, I grabbed a broom and went to work on my dirty kitchen floors that had been severely neglected while canning and kids tracking in mud everyday from the garden. In record time the floors we're shining, the house smelled so good, and I still had hours to myself. It is amazing how much you can get done in a day when you're not breaking up fights, seeing the newest lego creations, twirling with a princess, or having tea. Then I sat down to lunch by myself and I realized I was really missing all of them. I was missing having a tea party and playing legos. I didn't have anyone to watch "Psych" with me while eating lunch. And the house was still so quiet. I've never been so excited to see the bus come in the afternoon. The little kids came in bubbling with excitement, each talking over the top of the others, and then they saw the cupcakes. They were so excited to try them (I was too, as I'd waited all this time to try one.) There were sticky, marshmallowey, happy faces as they quickly ate them. I was so happy! Then the older girls came home and we repeated the same scenario without so much excitement and a little more drama as only teenage girls can have. Now we're on day 3, and as much as I've enjoyed some free time to myself and I LOVE being able to take a shower without at least one person knocking on the door, I'm really missing them, too. It's a happy balance of both. I look forward to them leaving, but I sure look forward to them coming home, too. I couldn't resist adding my cute (and goofy) kids. Natalie, Billy, Cheyenne, Jon, Maddie, and Chloe. Okay, okay, enough of my sappiness. On to, again, one of the best cupcakes I've ever made. A HUGE hit with everyone in the family, even Bill who's not much of a sweets, and really not cupcakes, kind of guy. Picture courteousy of Somewhat Simple because hers look much prettier than mine did. 2. With end of round handle of wooden spoon, make deep, 1/2-inch-wide indentation in center of each cupcake, not quite to the bottom (wiggle end of spoon in cupcake to make opening large enough). You could also use a melonballer to scoop out the middle of the cupcakes, instead of the spoon method. In small bowl, mix 1 cup vanilla frosting and the marshmallow creme. Spoon into small resealable food-storage plastic bag. Cut 3/8-inch tip off 1 bottom corner of bag (I used decorating bag and Wilton tip #12). Insert tip of bag into each cupcake and squeeze bag to fill. 3. In small microwavable bowl, microwave chocolate frosting, chocolate chips and corn syrup uncovered on High 30 seconds; stir. Microwave 15 to 30 seconds longer; stir until smooth. Dip top of each cupcake in frosting. Let stand until frosting is set. 4. Spoon 3 tablespoons vanilla frosting into decorating bag or small resealable food-storage plastic bag. Cut tiny tip off 1 bottom corner of bag (I used Wilton tip #5). Pipe loops on each cupcake. Does anyone remember this commercial? I love it! The dad is so happy and the looks on the kids' faces are perfect. That's exactly what my kids are looking like today - the last day of summer. Usually I'm not looking forward to school starting, I like my kids at home. I really don't look forward to homework starting, to the rush of getting everything done after school. And this year, all my kiddos will be in school all day! I'll have no one to "hang" with, no one to play with, no one to scrapbook with, no one to laugh with all day, no one to "help" me go shopping. Secretly, I'm a little bit excited about this, too. I'll have 7 hours to do whatever I want each day. I can mop the kitchen floor in the morning (a chore I despise) and have it last at least 7 hours! Anyhoo, we all are feeling very mixed emotions, sadness that our summer fun is over, but excitement at what lies ahead tomorrow. So here is some of my last minute prep for that big day tomorrow. 1. I finally got the tags made for Cheyenne and Natalie's instruments. (I've only been meaning to do this for 2 years now.) Everyone in band stores their instruments in the band room each day. That's a lot of basic, boring, black cases that all look alike. So I wanted to make something that not only identifies them, but distinguishes them from all the other cases making it easier to grab the right one. This is what I used: My Cricut; Childs Play, Walk in my Garden, Car Decals, and Plantain cartridges; chipboard (or old packaging like I used); scrap paper; stickers and rub-ons, eyelets, adhesive, packing tape. I started by cutting 3 oval tags (on tall ball setting) from the Plantain cartridge at 4" using the multicut and3 or 4 times (depending on the thickness of your chipboard.) One daughter thought she liked the thickness of two layers together and the other one liked only one layer. I then did "repeat last" but turned off multicut to cut 4 pieces of patterned paper. Then started gluing it all together. Natalie's in to turtles right now, so using the Car Decals cart, I cut the turtle at 2" and glued it all on the back. Cheyenne picked out "Laugh" from the Childs Play cartridge at 1 1/4" and the little flower from Walk in my Garden at 3/4" for the back of hers. When it was all dry, I added stickers on Natalie's, and rub-ons on Cheyenne's (wishing they were a little bigger), and then covered both sides in packing tape, my cheap way of laminating. Worked great! I then set the eyelets in the holes already cut, and TaDa! cute tags ready to identify anything. A cheap-I had everything I needed already on hand); quick-only took maybe a 1/2 hour to make both; easy-the cricut did all the work, I just glued; fun-they make me smile; great little project for getting ready for school. 3. My final project to accomplish today is to get some things printed while we're in town today. (We haven't replaced our color printer yet.) First are these great lunch Lunchbox Jokes from The Gunny Sack. Since school lunch prices have gone up again, my kids are going to be taking A LOT of lunches. 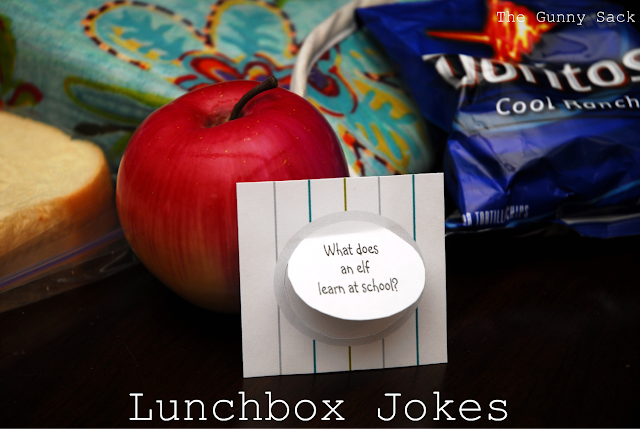 Billy loved getting a great joke in his lunch last year and I'd also sneak them in Cheyenne and Natalie's, too. I'm sure C & N would roll their eyes and then they'd chuckle with their friends at the corny jokes. I really like these ones from The Gunny Sack because of the lift-the-flap, just makes it more fun. I'm also searching for some cupcake toppers for fun treats for after school tomorrow. So that's it, these last minute projects and lots of fun, fun, fun today. I'm savoring every minute of my time with them today. I love my kids! So I have this awesome friend who is a fabulously talented cook. She's a great friend in this awesome cyberworld of ours, and even though I've never actually met her, I feel like we've been friends for years. So how do I know she's an amazing cook, because every recipe I've tried of hers quickly becomes a family favorite, 5-star rated, add to the recipe box (not just a printed copy) kind of recipe. So when Ginny posted pictures of this incredible oreo cupcake on facebook, I knew I had to try it. If I'd had unsalted butter on hand, I would have made them that minute. I now have unsalted butter stored in my freezer just in case I want to make these. :) So here it is, the best oreo cupcakes in the world. Recipe from the awesome Ginny of Simply Yum! 1. The first time I made them I put the oreo in the bottom of the cupcake wrapper as it said, and it stuck big time to the wrapper. I think we only had just a couple of cupcakes where we didn't leave the oreo in the bottom. So the second time, I just left that out and we didn't miss them at all, in fact that giant oreo in the bottom was, dare I say, a little too much at least for us. 2. I'd would lightly spray the wrapper to make it come off a little easier. Those oreos really stick to it, and make it a little hard to peel off the wrapper nicely. But really, with cupcakes this good, who cares if the wrapper takes a little work to get off. Also, the spray in the wrapper might remedy the problem above. 4. Make sure you have people to share these with or you will eat these all in no time flat, seriously! I'd love it if you followed me! The summer is coming to an end WAY to quickly, and every day seems jam packed for the rest of it. That's why it's taken me so long to post about our trip. So in between batches of beans I'm canning right now, I thought I'd share about our little family vacation. 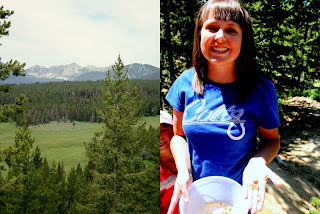 A few weeks ago, in July, we packed up and headed up to Montana for a little getaway. We went to Crystal Park on the first day and had a lot of fun searching in the dirt for little crystals. Bill would dig and fill the shaker box, then Cheyenne, Natalie, and I would shake out all the sandy dirt. Then Billy, Jon, Chloe, and Maddie would join us and we'd sift and sort through what was left and hopefully find some crystals. It was quite a lot of work, but we had a great time. The little kids would also wander around looking for crystals just on the ground. Every shiny rock they saw they'd pick up and come ask us, "Is this a crystal?" After a few hours of that and hiking around this mountain side, they were all pretty tired and started asking when we were going to the hotel. We ended up with quite a few little crystals and a couple pretty good sized ones. The view from the mountain side. Not a very good picture, but Cheyenne is holding some of the bigger crystals (we found a couple bigger ones) and you can see more in her bucket. So we headed into Butte to our hotel with a pool. The little kids were beyond excited about this - a pool!! That's were we spent the next couple hours and I think that was the highlight of the trip for the little 4. Although getting to watch TV while they were in bed was pretty exciting for them, too. The next morning we headed to Lewis and Clark Caverns and took the tour there. I'd forgotten what a hike it is up to the opening to the caves. On the way up as we were really getting our workout in, Bill and Natalie were questioning whether I'd signed us up for a "Fat Camp" vacation, especially after the hiking the day before, and all the walking we were going to do the next day, too. I think it's the first vacation that I didn't gain a pound. :) Anyway, the caverns were really fun and the kids all enjoyed seeing all the formations and stuff way down underground. After that we had a picnic lunch and then drove to Virgina City. Virgina City is an old mining ghost town. They have the old stores and buildings set up and displayed just like during the mining boom times. The kids thought that was pretty cool. We had some good homemade ice cream there, too, and of course the kids thought that was the best. That night we stayed in a little town called Sheridan and the girls and I had some fun walking around taking pictures of some cool churches around the block. 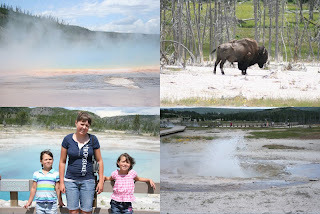 The next day we headed to Yellowstone Park. Lucky for us, we had perfect weather for all our walking and hiking around. It barely got up to 80 degrees one day and was never too hot or miserable (although the kids thought so at times.) As we were driving into the park, I asked Bill if he wanted to hit all the spots on the way to Old Faithful or go straight to Old Faithful and then hit all the stops on the way back. He decided we needed to go to Old Faithful first since we didn't know when it was going to go off. So we get into the parking lot and start walking to the site. We sit there for a few minutes and finally hear someone say it wasn't supposed to go off for another 45 min. to an hour. Bill decided we weren't going to sit there that long and that we should go get lunch. We quickly went to eat some lunch, rushing the kids the whole time, and then hurried back out to the site. Just as we're almost there, we see bunches of people heading back our way. Yup, we had just missed it! Well, needless to say, Bill was not happy and wasn't going to wait around for another 90 min.or so. So we left and stopped at all the other sites on the lower loop. 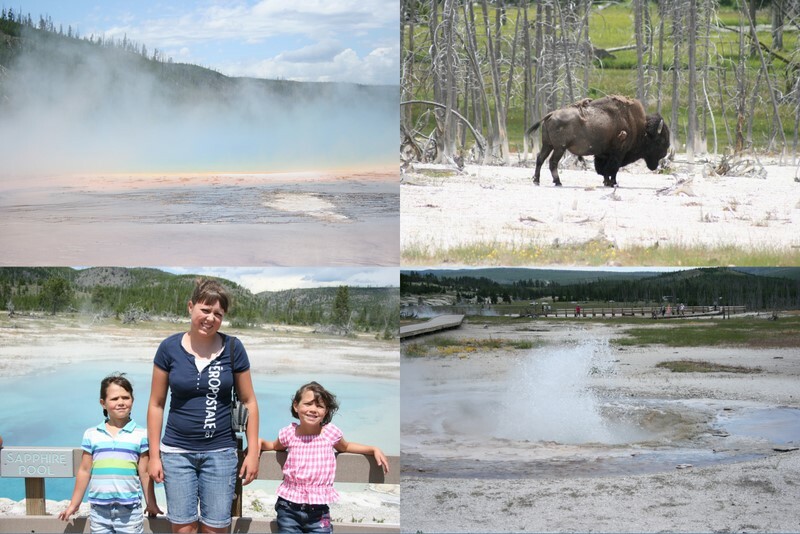 We'll have to try Old Faithful again next year. We were planning on heading up to the waterfall and some of the other sites up that way, but then the kids all started asking if we could go home. We were all pretty hot and tired by then, so Bill and I weren't going to object if they wanted to be done. We stopped in West Yellowstone and did a little shopping mostly for polished rocks (or poshed rocks as my little sister used to call them) and drove home. It was a quick 3 days, but we really had a fun time together. Best of all we have some great memories we can talk about for a long time to come.